Recently I received a cookbook in the mail for review. Cookbooks make me skeptical these days. Perhaps because I've laid down money for plenty of them and either ended up not loving the recipes or found them too complicated for daily life with small kids. Maybe it's just that I want a cookbook to answer many of life's challenges; make my life easier and more simple during the 'witching hour' with kids, meet the varied food needs, wants and desires of the different personalities in our house, but perhaps, the thing we're all looking for, some extra simplicity, even in some small part of our day. At first, I must admit, I was skeptical-- perhaps by the simple layout (no photos), and simple recipes. However, as I perused many of the recipes, tried others and familiarized myself with the lingo, icons and layout of the book I was won over. The "Don't Panic: Quick, Easy, and Delicious Meals for Your Family," offers just that-- easy recipes that require a short list of ingredients and can be put together with 30 minutes or less of prep time. We tried the Chicken Divan (a yummy, cheesy, broccoli and chicken bake) and Fresh Mozzarella and Tomato Salad for dinner one night last week. The recipes themselves went over well...the girls LOVED the mozzarella (Scott and I have had this salad before, but never thought to offer it to the girls), and anything with chicken and broccoli is a winner in our house. Unfortunately, right before we sat down to eat little miss Ava dropped a mostly full plastic bottle of lemonade on her foot leaving her screaming and the food getting cold on the top of the stove...I know that holds little relevance to a book review but I figured you'd like to know how things REALLY went down the night I tried to cook a meal, based on this book that I had agreed to review! No perfect pictures, or pretend perfection via photos of always smiling children in this blog space! When we did finally all get around to eating everyone enjoyed the meal. My favorite surprise ingredient in the dish may have been the nutmeg (wouldn't have thought to have added nutmeg to a chicken dish, but loved it!). The only thing I would change was the cheese it called for....The recipe called for 1/3 cup of swiss cheese, which I enjoyed, but was not the girls favorite-- I might use mozzarella or parmesan next time. I have to give Scott credit for this! That is his handy salad arrangement! We also tried the Pina Colada Smoothies as a mid-afternoon snack earlier this week. There are only four ingredients (which made it appealing to me!) in the recipe and the girls loved helping pour everything in the blender. The finished product... quick and easy! A two thumbs up rating. That's a compliment of the highest degree in this house! 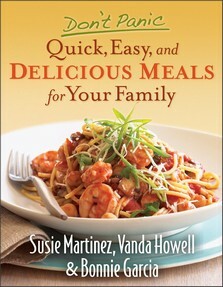 So, all in all, it's a great book, that offers some good quick and easy recipes, just as they promise. There are a number of other recipes that I look forward to trying; Blackened Chicken Quesadillas, Barbecue Chicken Wraps, Creamy Southwestern Tortilla Soup, Slow Cooker Coq au Vin, Apricot Glazed Salmon Beef Saute with Mushroom Wine Sauce, the homemade granola, and the Chocolate Cream Pie. 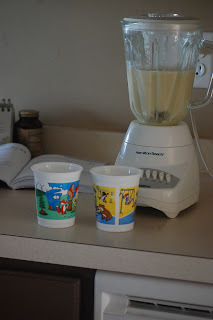 If you're looking for a yummy, easy afternoon treat/snack to try with your kids this week give this smoothie a try...I mean, after all, if it's going to be this cold in Buffalo in April we can at least momentarily channel the feel of the tropics with a little Pina Colada! Pour pineapple juice into blender. Add frozen yogurt, cream of coconut, and ice. Blend until ice is incorporated and well blended. Pour into serving glasses. Garnish with fresh pineapple slices and a maraschino cherry. I've been a bad blogger lately. Want to know why? Hmmmm...let's see what kind of excuse I can come up with and then see if you'll believe it. Here it is...The dog ate my homework. Pretty lame, huh? No dog here anyways...just kids...and they eat a LOT...including, it seems, the time I used to have to blog while they were napping. There you have it...my biggest excu...um...reason...for lack of blog posts. While we're on the topic...How in the WORLD do any of you mommas get anything done without a nap time in the day? I'm struggling. Big time. Help a momma out...I need some tips! Basically, life has been busy, crazy, nonstop. My house is never clean. I have freelance projects hanging over my head. My husband has been inundated with his own work stuff. 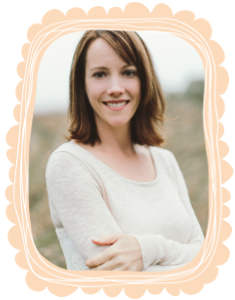 There have been birthday parties, Easter shopping, planning, cooking, visiting, crafting with kids, piles of laundry, preschool events, the list goes on and on....does this sound like your house? Please tell me it does! 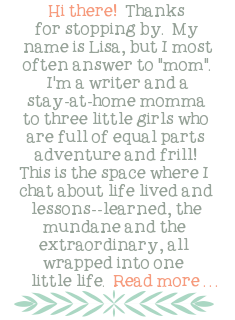 I was laughing to myself the other day because a couple of mommy friends were saying funny things to me...things like "Lisa, I wish I had a "passion"...you know, like your writing and blogging. I wish I knew what my "thing" was." Mere hours later I found myself reading Facebook and saw all of the WONDERFUL things that both of these friends were doing with their children; cool science projects, amazing crafts...super quality time spent with their kids. 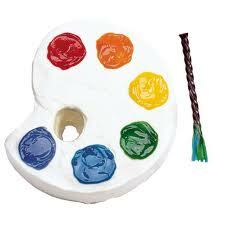 I started thinking..."I wish I had their abilities, know-how and time to do that kind of cool stuff with my kids!" I know there is no right or wrong, but it starts to feel that way sometimes, doesn't it? How funny that we all think we should be doing things differently... that we are envying some part of the other woman's life and they are envying ours. I'm not sure what to make of all of this at the moment...Just thought I'd throw it out there in case it resonated with anyone. I'm learning to reflect, but graciously; Is God trying to show me something in my questioning and frustration? Is He prompting me to change something, or simply teaching me to be content with who I am? Who he made ME to be. I'm learning to persist, but with flexibility; Life is challenging. Raising kids is hard work. Sometimes we need to put our heads down and just keep pressing forward. Sometimes we need to stop, pour a glass of wine (or grab a cup of tea!) and watch American Idol with our husband. Sometimes it is good to clean, and purge and organize...sometimes we need to just relax in the chaos, with the mess surrounding us. I'm learning to accept...wholeheartedly. Accept who I am...strengths AND weaknesses. Accept that I have limitations and that that's o.k. Accept that my sister is a WAY better housekeep than I am...it's always going to be that way! Accept that my kids may end up needing a little bit of therapy someday (hopefully just a little bit! ), but that it's all part of God's plan. Where I fall short, in being a wife, a mother, a sister, a friend...He nudges me along, and fills in the gaps where they need to be filled. But, perhaps most importantly, I'm learning to trust...without inhibition. Trust that God has this ALL figured out. Every. Little. Silly. Important. Detail. Of my life. Before I was born, written in his book and on the palm of his hand. I can't do ANYTHING to change it, I can merely press into it. So while the time in my days seems so much shorter, my heart keeps growing bigger. I came down the stairs, surveyed the littering of toys, papers, uncollected snacks from the day and coats strewn across the chair in the living room. I did not even consider picking them up, there was no energy left for that. I merely stepped over the toys, thought about how I would pick everything up tomorrow (maybe! ), found my way to the couch, sat down and closed my eyes. I was tired. Not dog-tired, no that is a silly turn of speech…mother tired is more like it. I had gotten up at 6:30 that morning in an attempt to find some time to read, write and pray. My 3- year old got up at 6:40. I saw her peek her curious eyes down the stairs to see if I would greet her with a smile or a growl. She never gets up that early…The growl I kept inside, the arms opened wide and I greeted her with a hug. I turned on the television for her and read a few pages in my Bible, looking for a bit of encouragement for the day. 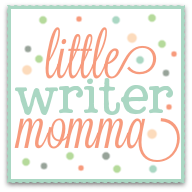 Looking for a reminder that there is a bigger picture…that even though I am in the midst of days where life is busy, and kids wake early, that God has a plan for my life that includes my being a great mother, but also time for my passions for writing, teaching and encouraging others. You see this is how it goes— being a mother while striving to pursue artistic, professional or personal passions— you plan to do things and your kids get up early or you’re too tired at the end of the day. You try to schedule blocks of time and then somehow the planning of birthday parties, the grocery shopping, the family gatherings, gymnastics and ski club soon cobble away at weeks of time and before you know it you’re not sure you can even remember your phone number, much less construct a sentence that would encourage or inspire a potential reader. He gets a grin on his face. He knows I’m not done. There are days when I think it would be easier to quit following my heart, my dreams, the things that tap inside my soul to be pursued…that it would be easier to not have expectations for those things then to live day to day in situations in which they seem impossible to reach? It’s a tempting thought. Some days. I read a book last year that I seem to reference quite often lately. The book was called Tender Mercy for a Mother’s Soul, the author Angela Thomas. Chapter 9 in the book is called “Passionate Contentment”. It’s about living life, our very busy lives with our families, while also carving out times for the things you are passionate about—the things some of us forget about (or want to quit!) once we have children. “Energy and skill, practice and perseverance, aspiring, training, becoming—these traits perk up my spirit and call me toward an intentional life. But just about the time I get inspired, thinking that God has put something passionate inside of me, the world marches in and screams, “Wait a cotton-pickin’ minute! What is all this aspiring, gifted, intentional stuff? You are a mother. You have four small children, for goodness’ sake. You do not have time to be passionate about anything that does not involve a home and kids. That is the question I want to be asking. How can I be a good steward with the few moments and spaces of time that I have left over at the end of the day? Now, this doesn’t happen all the time. I don’t want anyone to read this and walk away feeling guilty, or as if they have to add something else to their to-do list. Some days I’m just too darned tired. I read a magazine. I watch television. I simply go to bed. But then, perhaps the next day or the day after I read a trade journal (on writing in my case), journal for a bit, set some goals, or send a query letter to a magazine. It’s nothing major, but it keeps me moving forward. It’s small things…baby steps, but that’s the point. We may only have time to take baby steps towards our passions while our babies our small. Those steps, over time though, will allow for us to stay strong on our feet, keep our passions ignited and keep us connected to the outside world. It is then that I can really let out a sigh of relief that I am, fortunately, not the one in charge. And then I take one more baby step, a step towards choosing to have passionate contentment right where I am. 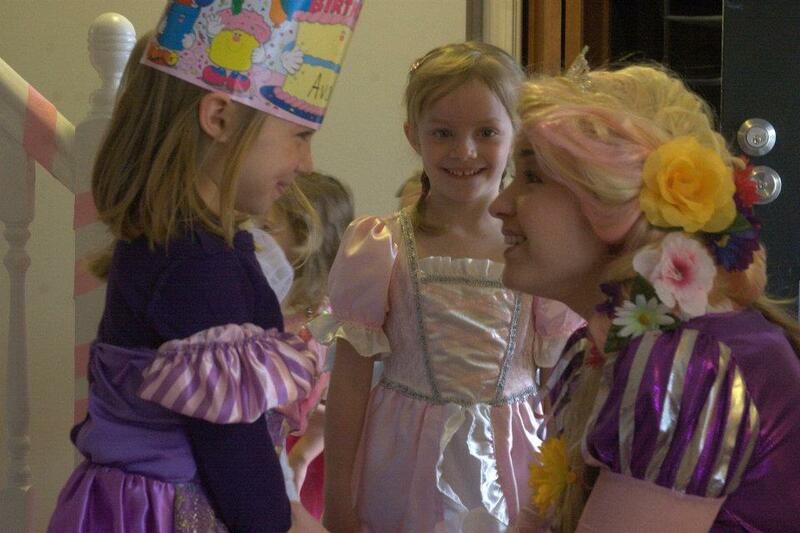 The birthday girl (left), my little princess (center) and "Tangled"! One of the things I love most about being a mom are the constant reminders about what life was like as a child: The enthusiasm, the unfettered faith, the curiosity, the ability to let things simply be magical...no questions asked. While it certainly is important that we grow up, that we become more responsible and develop our abilities to see life in more practical terms, we so often do so at the expense of those childlike qualities that we used to possess-- qualities that just might help us cope with life a little bit better, enjoy life a little more fully, live in a way as to be open and not closed to new experiences. I was reminded of this yesterday as I drove two little girls, both almost 5, to a birthday party; a Princess party. "I got up a early this morning to get ready for the party!" Alright, I'll admit, my first thought was...Your poor mom. I bet you did! Because, as we all know, parents of young children get a little crabby about their sleep-- more likely their lack of sleep on many occasions and for many reasons--everything from bad dreams to getting ready for princess parties. My second thought was...That's really sweet. I remember being a little girl and getting SO excited about holidays and parties and fun days planned with friends. Let's be honest, maybe I was also a little jealous. I lived in Buffalo's inner city when I was Amelia and Ava's age...we'll just say the girls I went to school with weren't having princess parties...I actually don't remember going to a birthday party until I was well into elementary school. But that could be, in part, also a testament to how times have changed. All that aside, I do remember being excited for Easter, and Christmas, for trips to the beach, or the zoo with a friend. I also remember waking up early, because my excitement was so real it seemed to be bubbling in my belly like bottle of shaken soda. Ava, as a matter of fact, must have been pretty excited too. She didn't say anything about it, but when she came downstairs at 8:05 she already had her princess dress on. She is usually not very quick to change out of her pajamas in the morning...at least not on school days! And so I took these two sweet girls to their royal party. Amelia had slept with her hair in braids and was incredibly proud of the "curls" it had created. I had braided Ava's hair in two side braids-- the first time she EVER sat still long enough for me to braid her hair. Their white tights peeked out beneath the tulle of their dresses, and they asked questions about when Rapunzel would be arriving at the party and how she was getting there all the way from Florida ("Rapunzel" was coming to read a story, play some games and dance with the girls!). It was a sweet party. Some of the girls completely and unabashedly believed that Rapunzel had flown (or drove, or walked-- the only thing that mattered was that she was here in Buffalo!) ALL the way from Florida (that is after all where princesses live in the U.S.) to see them. Others, the skeptical ones, like Amelia and Ava asked whether I thought "Rapunzel" was just dressed up (to be fair, I happen to know "Rapunzel" as does Ava, so when she eventually recognized her as "Meaghan's mom" she had the whole thing figured out). But mostly, they ran around in their dresses, ate pink cake, and were giddy about getting their picture taken with a princess. There were two older girls at the party...the birthday girls cousin and her cousin's friend, both around 10. Guess what? By 10, some of the magic is gone. They were cute...and sweet...and both dressed up...but you could see the skepticism in their eyes. They did do what 10 year olds do well with little girls...played and gave them all piggy back rides around the house! And so, life lesson learned? Reminder to be had? Our little one's DO grow up fast, despite my not wanting to believe that four years ago when Ava could hardly walk or talk. The magic doesn't last for ever. And as silly as all of the parties and dresses and getting up early can seem to us...it's BIG stuff to them. Let it be big and jump in full heartedly.